Consider a situation where you have found a position in your dream company and you got the chance to bag your dream job. You feel excited and ecstatic to send the application and you prepare the cover letter and the resume briskly. After doing a considerate amount of proofreading and revising, you decide to send the cover letter and resume along with the application letter. After reviewing the email you sent, you came to realise that there are some errors in both the documents. This situation may often lead to panic and distress from the candidate and many questions arises in how to curb the emergency. There are many doubts that occur in your mind. What should I do, if I find errors in my resume after I sent my documents to the employer? Do I resend the resume with an apology letter explaining about the mistakes or should I not do anything and hope that the recruiter does not see any mistakes? Finding a mistake after you have sent a document, is not going to demolish your whole career. If the error found is not a major one, then the best method is to ignore the whole situation and just save a corrected version of the document later for future endeavours. If your targeted job requires you to have a perfect and neat resume and a cover letter without any typos or human mistakes, then the best method to solve the problem is to resend the whole application along with a cover letter stating that you have updated the document. Also, try to know where the typo is and point it out on the cover letter, so that the employer will know that you have made necessary changes to it. Slightly change the mistake and send the newer version of the resume. Also, if your resume already has major issues and typos, such as misspelled words, incorrect format, or easily noticeable mistakes, then the next best method is to resend the correct resume as quickly as possible. Another added advantage is that, most companies use an auto saving format, so when you send an updated version of the resume, your old resume will get automatically deleted. And if luck is in your favour, the employer might not even know that your resume had a mistake. There are some cases where not resending the resume is the best choice. The first one situation being where the employer has not yet noticed the mistake in your resume. This is applicable for resumes that have minor mistakes and do not have any major correction issues. So do not bother to resend the whole resume just because of a misplaced comma or an aligning problem. Those mistakes are not considered to be a catastrophic mistake. The second case includes the situation in which the employer has seen the mistake, understands that it is inevitable and still decides to call you for an interview. These can be applicable for jobs, where there is no stress given to the integrity of the resume. For example: mechanical or similar physically demanding jobs. But this might not be the case, if you are applying for a writing position. The very first thing that they will judge about you is how you have written the resume and how you have presented the details in the resume. The third case involves the situation in which you are not able to meet the company standards and requirements and your resume has already been placed in the rejection pile. Then, sending the resume letter again will do you no good and will not increase your chances of getting the job. This case is also the worst case that could happen to the resume that you sent. How to Prevent Sending Imperfect Resumes? Try to keep your resume updated daily, or at least every once a week. This is necessary so that you could add more and more information to the final resume document, without getting all the information mixed up and also you get time to better prepare yourself, if any unexpected job openings would come. Even if you are currently unemployed, or you are not expecting any sudden employment move, it is wise to update your resume at least once a month or so. The next time you get an unexpected job opportunity, you do not have to race against the clock and create a hastily and briskly created resume full of mistakes and imperfections. Instead, through periodic updation of the resume, you are able to get a resume having the latest and up to date details about you and your skill-sets. To sum it up, use your acumen and common sense to decide what to do in these kinds of situations. A small typing mistake will not end the career of an individual in any way, nor will it demolish a candidate’s chance of getting the interview call. If the mistake is minute, then no need to worry and let the situation slide. Try not to think about it too much and just create a corrected copy for future use. 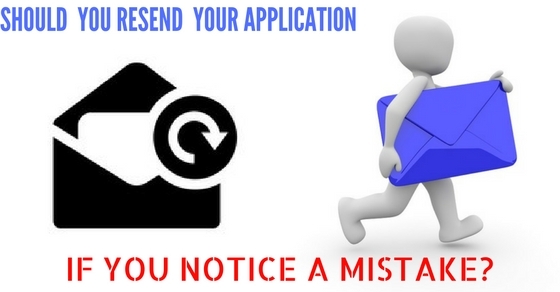 But if you are not sure about the degree of the mistake, whether if it is a small or a large mistake, then the best method to safeguard your chances is to resend a corrected resume, as long as the recruiter is not attracted towards where you have done the mistake. The recruiter should not know where exactly you had a typo. The very best method to prevent all of this mishaps is to proofread your resume a number of times before sending it to the recruiter. Just before you send the document try to proofread it again just to make sure that there are no mistakes in the document.